The MIT researchers-turned-entrepreneurs at a company called SolidEnergy have something you've probably heard before but also something you haven't. A battery breakthrough that will drastically increase your future phone's battery life? We've heard that before. New battery tech that is ready for production within a year? That's new. Most reports of major improvements in battery technology are high on optimism but low on information about reaching the marketplace. More often than not, research discoveries on batteries make it through one news cycle and if we ever hear about them again, it is many years later. While a healthy dose of skepticism is always good to have, the folks at SolidEnergy appear much closer to making our lives better than the average news story. Just as SolidEnergy was launching in 2012, another MIT spinoff company working on lithium batteries—A123 Systems—went bankrupt. SolidEnergy, still operating on a tight budget in a market suddenly skeptical of battery technology improvements, snatched up A123's production facility. 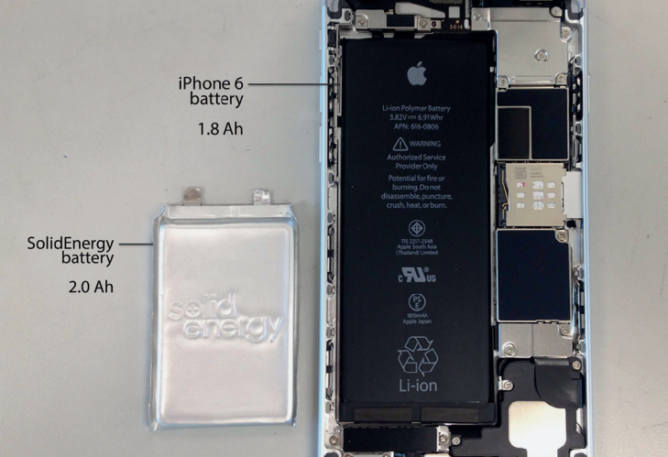 Initially a challenge, SolidEnergy had to make do with equipment designed to make battery components for consumer electronics. The big benefit of this is that, well, now SolidEnergy knows how to make their battery components with the same kind of equipment that will be needed to bring their batteries to the mass market. They don't make the batteries themselves, but they make these critical components that the likes of Samsung can then use to make a better battery—something SolidEnergy says is far more realistic than having one company, especially an ambitious startup, take over every step of the process. So how, exactly, will these people give us batteries that last twice as long? They claim to have solved an old problem. Lithium is a great material for batteries in some respects, but not others. Lithium metal electrodes—the parts of the battery where energy is stored, enters, and exits—react with the battery's electrolyte, which is the medium through which electrons pass to get from one electrode to another (during charging and discharging). These reactions cause reduced performance at best and explosions at worst, especially in rechargeable batteries. So why bother with lithium at all? Well, lithium is so reactive compared to other similar materials that it can store a lot more energy. Beyond that, it's also lighter than most other materials used for batteries. We use lithium-based batteries because they store more energy and weigh less at the same size along with some other advantages we won't go into here. To deal with those exploding problems, one electrode is usually made of carbon and another is a lithium compound; the tradeoff are a little less storage capacity, a little more size, but much less risk. The folks at SolidEnergy are creating batteries with pure lithium metal, making it much more energy efficient. What about those pesky reactions? SolidEnergy is using a different type of electrolyte that doesn't react with the lithium. There are some more details that I'm glossing over as well. The diagram above is meant to show the scale of the improvement with these batteries. SolidEnergy's technology is the one on the far right. As the hero graphic suggests, the first of these batteries are expected in drones right away, in November 2016. Wearables, cell phones, and other small consumer electronics should start getting these types of batteries by 2017 if all goes well. SolidEnergy's goal for electric vehicles is 2018, which is strategic. They say that those batteries are so difficult to design and have such high demands that many companies go under while trying to work out all the kinks. Instead, they want to get the immediate and more feasible payoff on a smaller scale first. That's fine with us!